Engaging, sharply written and thought-provoking thriller with strong performances from Charlize Theron and an Oscar-nominated Tommy Lee Jones. Written and directed by Paul Haggis (Crash), In The Valley of Elah stars Tommy Lee Jones as ex-military MP Hank Deerfield, who is compelled to investigate when his son Mike (Jonathan Tucker) is reported AWOL shortly after returning from a tour of duty in Iraq. Charlize Theron plays local police detective Emily Sanders, who reluctantly joins the investigation and finds herself clashing with the military brass (including Jason Patric and James Franco) when the evidence begins to point towards foul play. Tommy Lee Jones recently received an Oscar nomination for his role here, which is interesting, because it's extremely similar to the role he plays in No Country For Old Men. At any rate, he delivers a superb performance, particularly when giving the film's explanatory central speech about the Valley of Elah (the site of the battle between David and Goliath). Charlize Theron is equally good, gradually making us realise just how strong Emily has had to be to survive in her male-dominated, frequently patronising environment - this lends an extra edge to her clashes with Patric. There's also strong support from the likes of Josh Brolin (sporting that same moustache for the fifth movie in a row) as Emily's boss and Susan Sarandon in a small but effective part as Hank's wife, Joan. The script is excellent, drawing subtle, thought-provoking conclusions about the dehumanising nature of modern warfare without getting heavy-handed or overly preachy (although the upside-down flag symbolism may be pushing it a little). 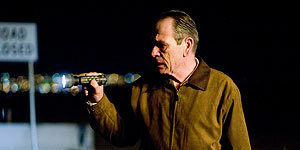 There are no easy answers here and, unusually for a Hollywood thriller, the film leaves you with a lot to think about. In short, In the Valley of Elah is an engaging and provocative thriller that's worth seeing for the superb performances from its two leads. Recommended.